The Super Bowl is less than a week away and since it’s taking place here in Minneapolis I had to share a twist on a Minnesota classic, Tator Tot Hotdish making it more game day “appropriate” making a Tator Tot Hotdish Pizza! Depending on where you live you may or may not know what a hotdish is, if you live in Minnesota or midwest you probably know exactly what a hotdish is! You would also than know that the most famous hotdish is Tator Tot Hotdish. So if you are completely lost as to what I’m talking about a hotdish is basically a casserole. Tator Tot Hotdish is basically cream of mushroom soup, ground hamburger, and green beans baked in a dish topped with tator tots. Honestly if we had a state food this would probably be it. My oldest daughter, S, and my husband will request this as soon as the temps get cold in the fall. Since I couldn’t see serving hot dish at a Super Bowl party and pizza is a staple game day food it seemed fitting. Maybe crazy but fitting and I like to play with my pizzas so it was one of the first things to pop in my head when I decided to do something with different. 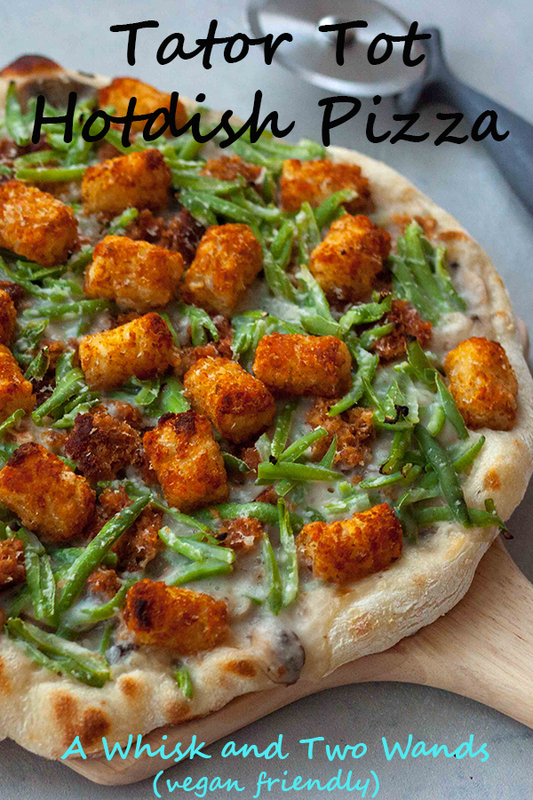 While some think the tator tots might be the craziest thing about this pizza I think it’s the green beans. Picturing that kid out there sitting at the table missing the big game because he wouldn’t eat his green beans. If you’re a mom, or were once a kid that didn’t like a vegetable, you know what look I talking about. Well had his mom made this pizza he would have probably inhaled his green beans and even some mushrooms! I still haven’t decided what I’ll throw together for Super Bowl, right now I’m thinking it’s between my Vegan Kimchi Nachos and Vegan Thai Tacos that I just can’t get enough of lately. Although I just had the Kimchi Nachos last week as I had to photograph them for something SUPER coming! Maybe we’ll just have a big platter of buffalo cauliflower and other veggies or let the girls decide. Now for my SUPER exciting news! I’m going to let you in on a little secret before I posted it on social media. Things have been a little quiet maybe and will probably be this week because I’ve been asked to collaborate with Athleta at the Mall of America this weekend for a Super Bowl event! So yes only miles away from where the Super Bowl will be played and it’s going to be crazy! I’ll be down there handing out samples and sharing some healthier game day options. Don’t worry there is something in it for you even if you don’t live here in Minnesota. I’ll also have a SUPER giveaway over on my Instagram! What’s so super about it? Well it’s going to be big and include products from local brands, some of my favorite brands, and even $$$ gift cards to Whole Foods and Athleta! Trust me you won’t want to miss your chance at this one. While that’s coming up quick it’s still Monday and that means a Meatless Monday link up. My co-host Deborah and I want to know what you’re cooking or whipping up in your kitchen. Link up and share a recipe or tell us in the comments below and I hope you check out the other recipes linked up and are inspired by at least one of them. 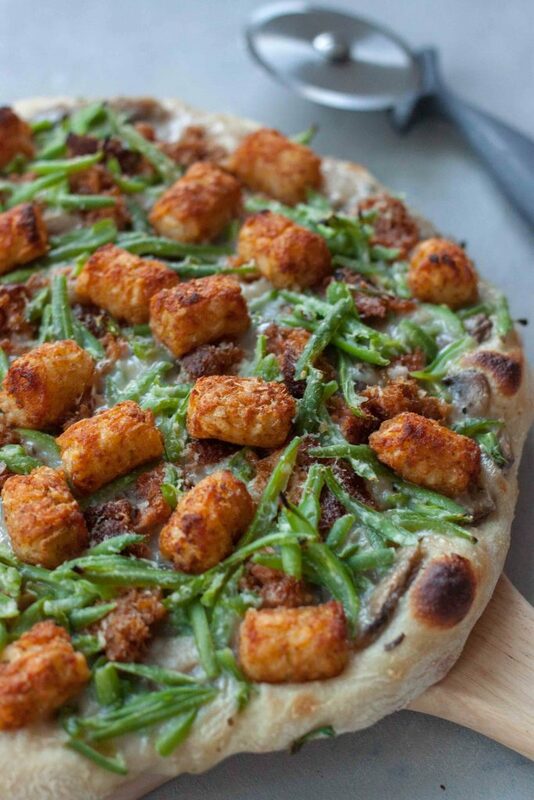 Twist on a Minnesota classic, Tator Tot Hotdish making it more game day appropriate Tator Tot Hotdish Pizza! Vegan, gluten free friendly. If you are making mushroom soup you will also need to allow 30 minutes to make that but it can be made ahead of time, and is actually best as it thickens as it sits. Otherwise you are free to use any creamy mushroom soup you have homemade or store bought. You will also have to cook the tator tots per package instructions and heat your "meat". The tator tots can be made while making soup and heating your burger. Spread cooled mushroom soup on the crust as you would pizza sauce leaving 1/4-1/2" boarder around the edge. Sprinkle with crumbled burger and green beans. Top with cooked tator tots and top with a little cheese. In a large skillet over medium/high heat just enough oil to coat the pan and sauté onions . Grate in garlic and add mushrooms. Cook mushrooms on medium uncovered until they are tender and have been reduced by half. Sprinkle tapioca flour in and stir to mix. Once the mixture starts to bubble add in the broth. Reduce to medium/low, stirring occasionally for about 10 minutes. Remove from heat and stir in coconut milk. It’s the most Minnesotan…. I figured it was either a good idea or I was off my rocker! 😉 Hope your boys have fun when they’re here. I’m not a tator tot lover but wow never having one I thought they were a school lunch staple. You’ll have to let me know what you think. 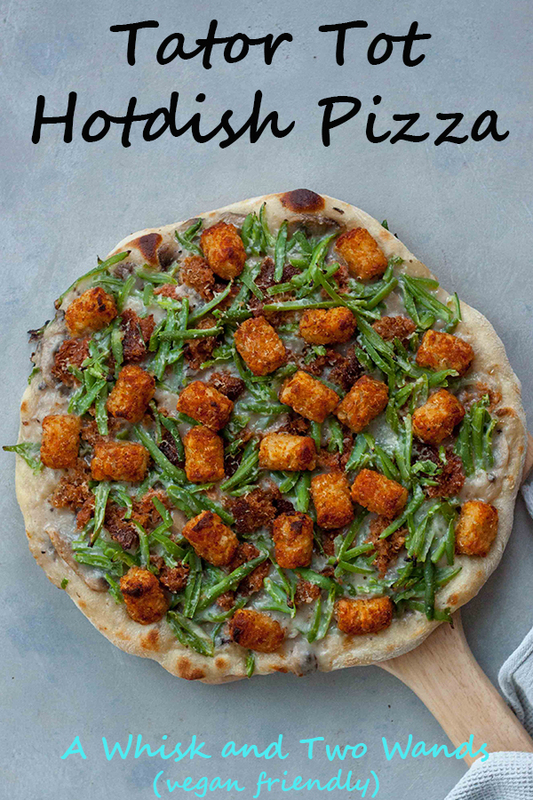 I’ve never thought to put tator tots on my pizza but this looks incredible! oooh now this I have to try! Tater tots were my jam as a kid, so this recipe takes me back! Happy to take you back! I’ve never tried this kind of pizza before, but I think I have to! I love tater tots! 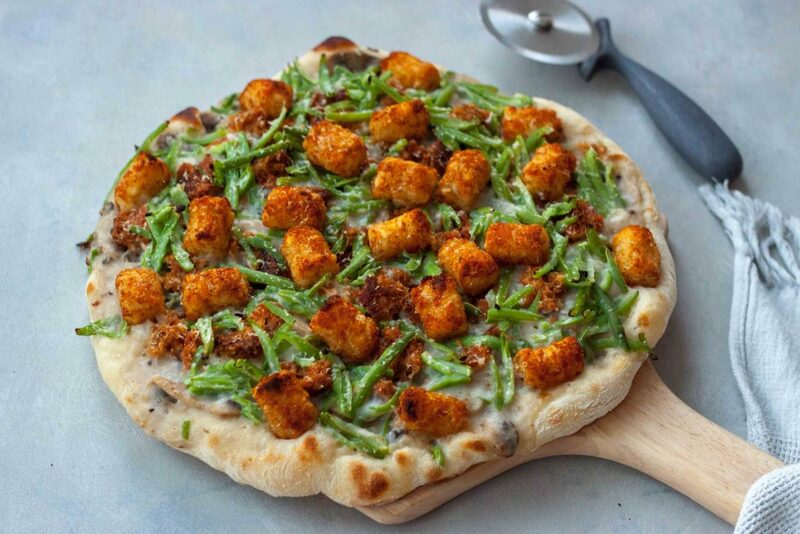 I’m not sure it’s ever been done I’ve never seen tots on a pizza so thought it was a good idea or very crazy, haha. Oh wait what tator tots are carbs? 😉 Haha it is filling and a slice goes a long way. What a fun and creative pizza! 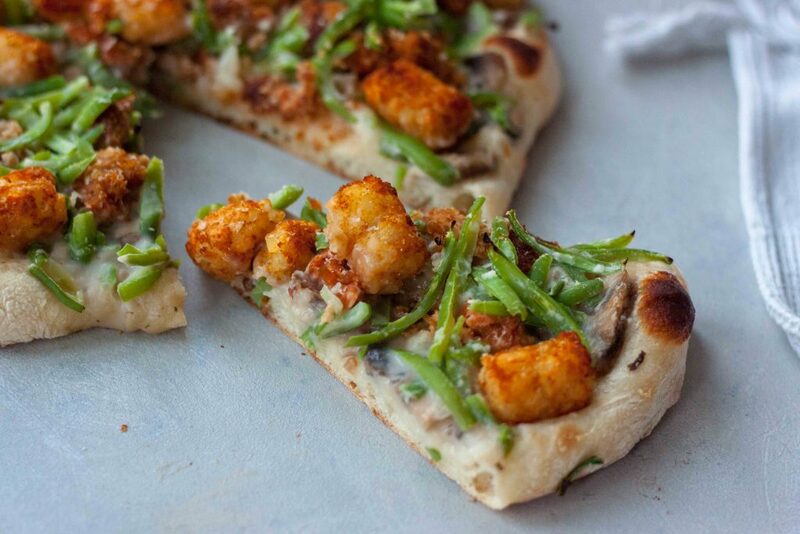 Perfect for Friday night pizza night! If you do keep me posted! It’s really filling and they’ll get some veggies. Crazy! They are a staple in Tator Tot Hotdish so I couldn’t make a Tator Tot Hotdish Pizza without them. Wow, that crust looks too good to be true! Always in love with hotish pizza. Good job! The crust is a game changer for sure, it’s our homemade Neapolitan! Totes making a GF version of this! Looks so good! The crust works really good with Cup 4 Cup gluten free flour! Haha, too funny you will have to make just for the fun of it! I have never heard of hotdish… but it sounds good! This pizza, looks crazy good!
. Followed recipe except I added fresh mushrooms and used ground lamb instead of beef per hubby’s taste preference. Thanks for the recipe will make again.